On Monday, June 2nd, Ron Peterson celebrated his 40th anniversary at First State Bank of Western Illinois. Directors, officers and employees attended a breakfast in his honor. Ron started his banking career in La Harpe in 1968 as an Agricultural Loan Officer after graduating from Western Illinois University. He has been President of First State since 1980 and was instrumental in forming the holding company, Lamoine Bancorp., Inc. in 1988. The bank has grown to serve 6 communities including Carthage, Macomb, Hamilton, Blandinsville, Monmouth, and La Harpe. Ron has experienced many accomplishments, and in 2005, he was named "Banker of the Year" by the Illinois Bankers Association and honored at the annual convention in Indianapolis, Indiana. Currently, he serves as a member of the Board of Directors and is a member of the Executive Committee of QCR Holdings in Bettendorf, Iowa. 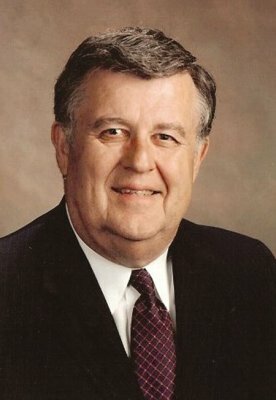 He has served on many boards and committees with a focus on banking and community service. "His purpose today is securing the future of community banking, especially in the areas First State serves. The upcoming merger with First State Bancorporation Incorporated will take the bank to a new level and is an exciting move" First State officials say, "as the bank faces the challenges in today's world." Ron resides in rural La Harpe with his wife Gayle. They have 3 daughters and 8 grandchildren: Rhonda (Bruce) Leahy, Erin, Olivia and Nate of North Carolina; Leahann (Trenton) Borth, Lance and Ryan of Oglesby; Mary (Bryon) Borth, Molly, Shane and Peter, of Bloomington.